When it comes to real estate, the likelihood of a buyer working with a lender is high. In fact, it’s pretty much the standard. Unless a buyer has enough savings to purchase a property outright, a lender is the most likely option when it comes to financing. Buyers working with a lender will go through a very specific qualification process. This process will usually involve credit reports, debt to income ratios and other requirements necessary for a bank or lender to sign off on funding. However, as a buyer, you should also qualify your lender. What are the most popular mortgages you offer and why? A lender will have standard mortgage options, but some credit unions and local lenders can offer specialized mortgages. These specialized mortgages can have additional incentives or desirable options for buyers. Make sure to get a full list of what is available to you in order to maximize your loan. What fees are included in my loan? What fees are due at closing? If possible, try to pay fees in full at closing rather than rope them into your loan. Whatever is included in your loan will be subject to interest and terms. Are the rates, terms, fees, and closing costs negotiable? Lenders will have a little leniency when it comes to negotiating the specifics of a loan. If it’s negotiable, make sure to talk it over with your lender and ask for the best deal possible. Are there any discounts for inspections, homeownership classes or setting up automatic payments? Even though a homeownership class may sound silly, it can make a pretty big difference when it comes to discounts. That leaves more money in your pocket at the end of the month. What mortgage options will require PMI? Are you able to estimate totally monthly payment? Lenders should provide you an estimated monthly payment. It may not be exact, but a general idea of the monthly cost will help when you are budgeting for your new home. Are there escrow balance requirements? A lender may require a balance in your escrow account in case of property tax or homeowners insurance adjustments. This can affect your first years payments so make sure you understand if this is a requirement or not. What bill-pay options are available? Larger lenders may offer online and auto-withdraw payment options, but smaller or local lenders may not. 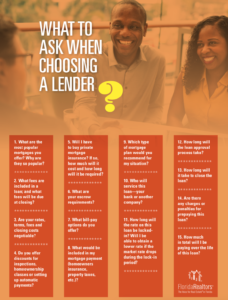 Check with your lender for the complete list of option available. If you are unable to make online payments, ask if bill-pay (through your banking institution) is an option. Your payment could include escrow for property taxes, homeowners insurance, PMI insurance or additional fees. A full list of what will be included can alleviate the guess work down the road. What type of mortgage would you suggest for my situation? Provide a lender information about your financial situation, credit score and the type of home you are looking for. With your specifics, they can recommend options that are best suited to you. Who will service my loan? What is the likelihood of my loan being sold? Loans are sold all the time. But the likelihood of anything changing on your mortgage is slim. However, it will change your customer service team and may affect your payment methods. Will I have a locked rate? Am I able to obtain a lower rate if the market drops while I’m locked in? Some lenders allow rate changes with an application or other forms and paperwork. Other lenders will not alter your rate for good or bad once it’s locked in. What is the estimated length of time for loan approval? Provide this information to your realtor. The loan approval process can vary drastically so making sure everyone is on the same page is key. What is the estimates length of time for closing? The amount of time it takes for a lender to close on a loan can make all the difference in a property contract. Everything will come to a stand still if your lender is not ready by the settlement date. Make sure your lender can provide a timeline that makes sense for your schedule. Are there any additional fees for prepayment? Some lenders will charge a fee if your loan amount if paid off early. Make sure you know about all fees before you sign the paperwork. What is the total cost of the loan if I follow the payment schedule? After fees, interest and principal payments, the total cost at the end of your loan term can vary drastically. Compare the total payment amounts before choosing which mortgage type to move forward with. Finding the perfect mortgage lender means looking past the initial interest rate. Choose a mortgage company that has a staff of professionals, and has the time to answer your questions. Don’t be another account number. Partner with a lender that will show you different options for your situation. And don’t settle for the well known banks of the busy intersections! A credit union is a member-owned financial institution offering favorable interest rates to shareholders. And many have eased membership restrictions, so it’s likely you can find one to join. The costs of membership can vary as well as the requirements, but the benefits can be a huge savings in the long term. Savings & Loans are still a great option for home lending. Search for the S&L closest to you and visit their location in person. Usually a smaller financial institutions, S&L’s are often very community-oriented and worth seeking out. And if the S&L’s aren’t in your area, find a Mutual Savings Bank. Like savings and loans, mutual savings banks are locally focused and often competitive. With multiple lenders and financial institutions at your finger tips, you are sure to find a mortgage that fits your needs.